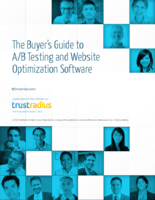 TrustRadius is excited to publish our first Buyer&apos;s Guide to A/B Testing and Web Optimization Software. It follows our Buyer&apos;s Guide to Conversion Rate Optimization Software and Buyer&apos;s Guide to Digital Analytics Software, and is based on almost 200 in-depth reviews by authenticated users of A/B testing tools on our site, www.trustradius.com. A/B testing is a fast-growing category, as companies are increasingly using testing to optimize their websites. Software vendors are following suit by trying to make the tools as easy as possible for marketers to use. In a recent TrustRadius survey, 44 percent of respondents said they spend more than $10,000 per year on A/B testing software, and 48 percent expect to increase their spend in the coming year. Traditional analysts cover online testing software, but we feel there is an opportunity to present first-hand insights from real users of each tool. We also recognize that small businesses and billion-dollar enterprises have very different needs; therefore, we present A/B testing tools by their adoption and ratings among small businesses, mid-size companies and enterprises. This helps you narrow your search and find the solutions that best fit your needs. I would like to thank Megan Headley, Research Manager at TrustRadius, for reading every review, conducting numerous expert and vendor interviews, and writing this report. I would love to hear your feedback on this guide. Did you find it helpful? How can we improve it? Please email me at vinay@trustradius.com or find me on Twitter @vinaybhagat. This guide is a distillation of almost 200 in-depth reviews from real end-users of A/B testing tools. Those insights are augmented by interviews with highly regarded consultants, as well as executives from software vendors. A clear definition of A/B testing software and the various features the tools might include. Advice from experts on achieving success with A/B testing. 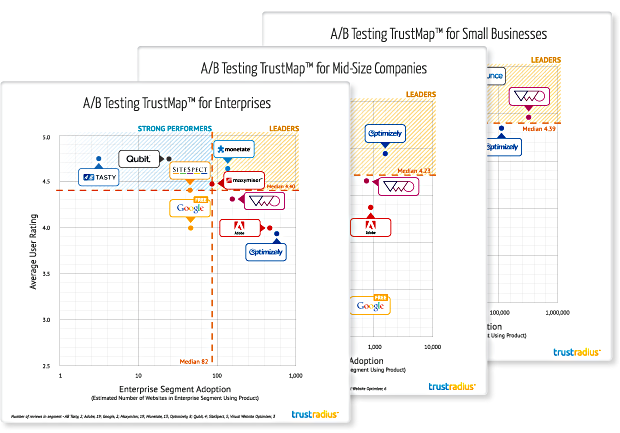 2x2 charts we call TrustMaps showing the leading solutions among small businesses, mid-size companies and enterprises, based on average user ratings and approximate adoption rates. Profiles of each software vendor, including interviews with senior executives at the company, as well as strengths and areas for improvement according to end-users. An exploration of the major trends. The existence of relatively low-cost and easy-to-use tools has enabled an increase in the practice of testing among marketers. In general, companies might move from having one A/B testing champion, to a team dedicated to testing, to a testing-based culture, where different business units across the organization are involved in testing. Many companies are using more than one testing tool, each tailored to a different technical skill level. A/B testing vendors are highly focused on ease of use and enabling the marketer to perform advanced tasks without relying too heavily on IT. Currently, pure-play testing vendors such as Monetate, Maxymiser, SiteSpect, Optimizely and Visual Website Optimizer are besting traditional suite vendors. Software vendors might be ahead of their customers on personalization. Most experts agree the practice has potential to increase conversions, but needs to be automated in order to be scalable. What Is A/B Testing Software? Personalization: The Next Big Thing? Will Testing Be Standalone or Embedded in Other Tools?